My students have been working on a locative media project–a mobile story of the Battle of Kennesaw Mountain that is activated on site, as you pass various landmarks. Originally we were supposed to meet as a class on Friday and walk the 6-mile loop up Little Kennesaw and back down Kennesaw, but the threat of rain made us cancel. This weekend, we planned on going on our own to see how well the project worked. At least not for me. I had the app running on my phone, a couple of things popped up on my map–but no content. I’m not sure if the project failed or if there was “user error” on my part, but I got nothing. So instead, I just walked the 6-mile loop and enjoyed the day. 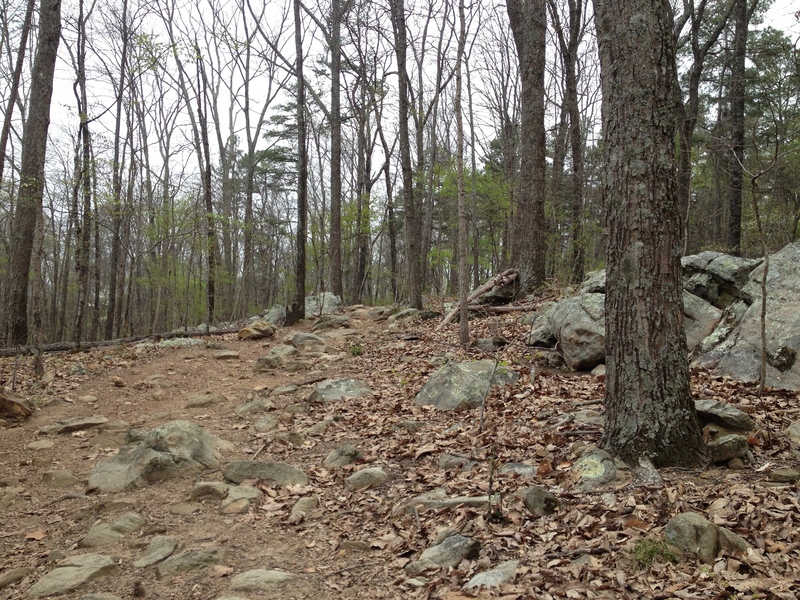 The twin peaks of Kennesaw and Little Kennesaw barely deserve the name “mountain”; though the trail does get steep toward the top, and there is a good bit of exposed rock. In the 22 years I have lived in the area, it was my first time I made the hike. Even though the project failed, I got to explore an area in my own backyard that I had never been to before. And it’s always good to have an excuse to spend a couple of hours walking outdoors…. I’d like to say that the whole two hours was one extended session of walking meditation, but that would be a big exaggeration! No, I was happy to take a few moments now and then along the walk to really see the woods, and to really listen to the sounds around me. Then I was back to checking my phone to see if the project was working, or to see how much further I had to hike, or to see how long I had been on the trail…. And that’s just fine. I’ve come to recognize that the most important thing for me is to appreciate those moments of attentiveness when they occur–and not sweat too much their fleeting nature. This entry was posted in Uncategorized and tagged attention, listening, mindfulness, nature, simple action. Bookmark the permalink.